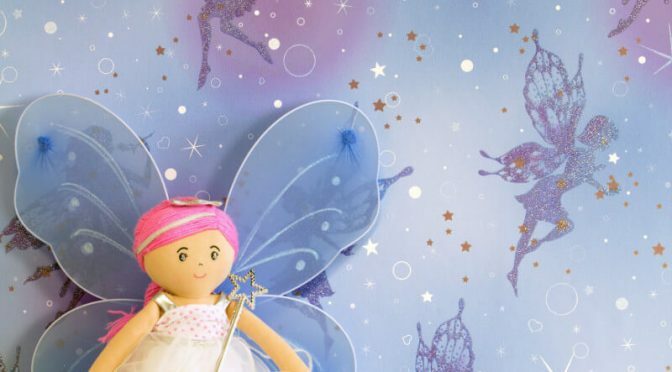 Coloroll Be Dazzled Fairy Dream Moondust Glitter Wallpaper is a great way to add a touch of fun to a child’s bedroom this season. To begin with, this eye-catching wallpaper is part of the stunning Be Dazzled Wallpaper Collection. So it will make a welcome addition to your home. The wallpaper features a whimsical fairy inspired design and comes in a muted yet beautiful colour scheme. Furthermore, the raised glitter gel finish adds a hint of sparkle for a magical look. Finally,, the Coloroll Be Dazzled Fairy Dream Moondust Glitter Wallpaper is perfect for use throughout a room or as a feature wall. Add metallic accessories for a great finish.